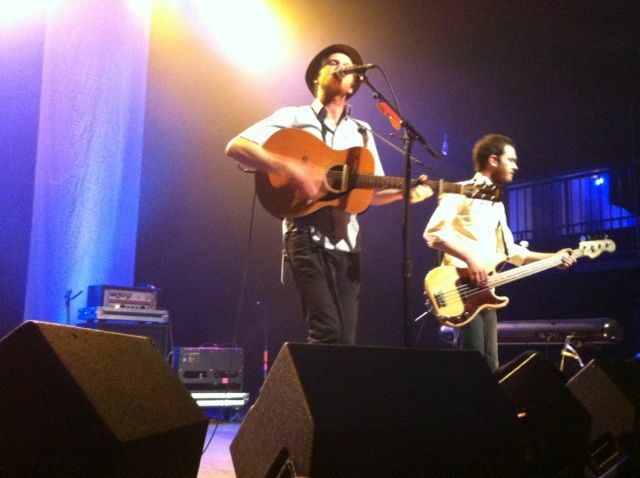 I took myself to The Fonda Theater on Tuesday, to see The Lumineers for their second sold-out night in LA. Take the slightly melancholy feeling of going alone to a concert and weigh it against the pleasure I took in the show, and my loneliness was a feather against a bar of gold. I'd do it again in a heartbeat; the show was simply amazing. The opening band was a spazzy punk quartet of especially dirty hipsters called Bad Weather California that mostly made everyone confused and uncomfortable (at least, everyone around me). Confused because at moments they were quite engaging, while at others, their lack of chemistry was palpable. And uncomfortable because they looked truly miserable onstage, sneering at the audience until halfway through, when they suddenly seemed happy to be there, but curiously angry at their instruments. I've never seen a mic stand pinch hit for a guitar pick. Impressive but rather empathy-inducing for the stand. The lead singer and bassist kept lurching across the stage and plunging to their knees, jamming dueling electric guitars in violent, self-referential irony that had the net effect of making me feel mocked. Oh, I get it. Rockstars who get crazy onstage are so cliche. Some openers are like getting a surprise helping of your favorite dessert first, and some are like an appetizer that no one finished and everyone wishes would just get cleared off the table. This was the latter. Their songs were harsh and discordant, and not in that satisfying punk way. I think they're either a band in search of their sound or a sound in search of an audience. 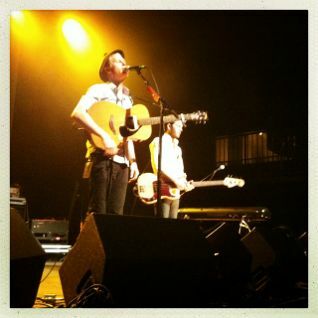 The Lumineers, however. . . The two words that came to mind again and again while I was watching these folk rock wunderkinds are "charming" and "captivating." That's how I felt, for an hour and a half. Charmed and captivated. It was less like watching a band then a family, that's how genuine and deep the connection seemed between them. After the first song, lead singer Wesley Schultz asked that cell phones be put away, which was brilliant, because it forced the audience to disengage from the outside world and plug in, for ninety minutes, to a visually stunning symphony of sound and emotion. Songs weren't just played. They were experienced, by each member of the band, lyric by lyric and note by note. They could not stop smiling: at one another, at the audience, at their instruments (even when there were technical malfunctions) - even, it seemed, at their enjoyment in Having Their Moment. I just did a triple gainer off the hyperbole board, huh? Sorry. Let me swim to the surface and catch my breath. Each track, lovingly sung along to by a house packed with adoring fans, was teased into some slightly different iteration than its album version. Some were made more uptempo; some less. Some were kicked up with the help of a gorgeous, fat bass drum sitting on the edge of the stage, and which percussionist Jeremiah Fraites thumped with verve and obvious joy. 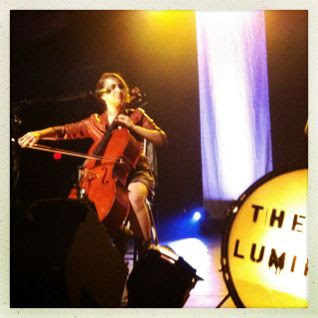 And some were slowed down, stretched out like strands of honey-flavored taffy in the graceful hands of cellist/singer Neyla Pekarek. And, oh god. The duet. The as-yet unreleased duet that she and Schultz sang. Just wait. It is gorgeous, and has soundtrack to Kindle commercial written all over it. I can't wait to put it on loop. They engaged the audience from first to last, dividing the venue into floor vs. balcony, for singing the refrains of songs that seemingly everyone knew by heart. Afterwards, thunderous applause brought them out for a four-song encore, one of which they performed, a capella, split between The Fonda's two opera boxes - on opposite sides of the theater. Jeremiah played the glockenspiel for that number, and all the band members were giggling, struggling to hear one another's cues from a hundred feet apart. Meanwhile, a hushed crowd looked back and forth, tennis match style, at this utterly captivating ending to their evening. In order to even get in the balcony boxes, they had wade out into a sea of people and climb up into these pockets in the wall, with the help of the audience. It all felt delightfully mischievous. Finally, they returned to the stage and did a cover of You Can't Always Get What You Want, accompanied by the opening band (which definitely redeemed them). Nine people (The Lumineers had two additional musicians performing with them, but the core group is Schultz, Pekarek, and Fraites) all on instruments, and all singing. 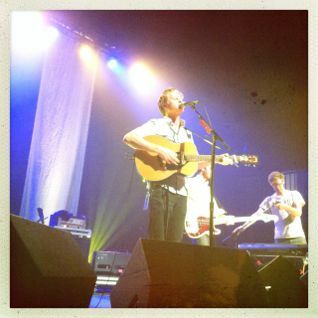 It was layered, playful, and charming, and bar none the best encore I've ever seen. Just a little more gushing, because a review of the show wouldn't be complete if it didn't touch on how they looked. 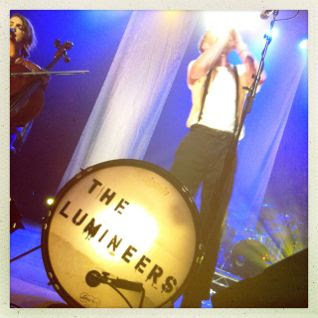 The Lumineers are a folk rock band who describe themselves in humble terms. Schultz has said, "We’re not reinventing the wheel or doing anything that different, the songs are super simple. The ideas themselves are very simple ideas." And the group has done a superb job of translating this conceptual simplicity into their physical aesthetic. Jeremiah: suspenders over a plain white tee, faded black chinos, and slicked-back blonde locks. Neyla: simple jersey sundress, leather jacket, and leather boots that she stomped with girlish glee. Wesley: nondescript vintage cotton from head to toe, topped by a crushable felt fedora that fell off whenever he tilted his face up to the balcony. I felt like I was watching depression-era newsies cutting loose after a long day. I don't think I was the only one feeling positively transported, either, by everything I heard and saw. And I know I'm not the only one who will keep a close eye on this band, and hopefully for years to come.